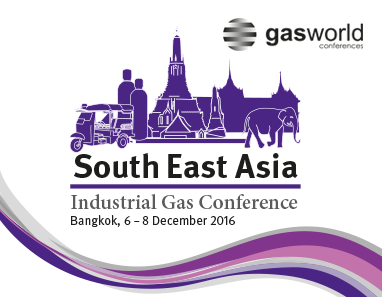 Gasworld is pleased to announce that booking has now opened for its South East Asia Industrial Gas Conference, taking place at the Shangri-La Hotel in Bangkok, Thailand from 6th-8th December 2016. The event will include a cutting-edge conference agenda featuring prestigious speakers, dedicated exhibition time and valuable networking opportunities. In the context of economic headwinds and a number of end-user market challenges stifling opportunities for growth, market intelligence and value creation is arguably more important than ever before. Against this backdrop, gasworld’s South East Asia Industrial Gas Conference 2016, titled ‘Tiger Economies and Opportunities to Roar,’ will explore the markets creating opportunities in the region – and discover how the industrial gas community can successfully do business in these emerging markets. We will be inviting a host of both national and international industry specialists to take to the stage to discuss the latest industry innovations. More information about the agenda can be viewed on the gasworld conferences website. Participation opportunities are available for delegates, event sponsors, and exhibitors, with anyone looking to attend the conference encouraged to take advantage of the Super Early Bird delegate rate which will end on 5th August 2016. For more information or to book your place visit www.gasworldconferences.com or alternatively, email conferences@gasworld.com or call +44 1872 225031 to request a booking form.